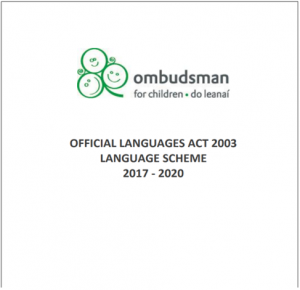 Sheol Oifig an Ombudsman do Leanaí (an OOL) go foirmiúil a chéad Scéim Gaeilge in 2017, a chuirfidh tús leis an bpróiseas lena mbaineann seirbhísí Gaeilge a sholáthar don phobal i gcaitheamh na chéad trí bliana eile amach romhainn. Forbraíodh an scéim chun an Ghaeilge a chomhcheangal isteach in obair na hOifige agus chun na seirbhísí atá ar fáil don phobal trí Ghaeilge a fhairsingiú. Forbraíodh an scéim seo i gcomhréir le hAcht na dTeangacha Oifigiúla, 2003. Eagraíocht neamhspleách is ea an OOL a thagann faoi chuimsiú roinnt oibleagáidí seirbhíse poiblí. Ceanglaítear san Acht ar chomhlachtaí poiblí cuntas a thabhairt ar na bearta a bhfuiltear le glacadh leo agus chun amlíne shoiléir sholáthair a leagan amach.